Kankaria Lake, Kid's City, Gate 7. MYBYK NOW COMES TO KANKARIA!! 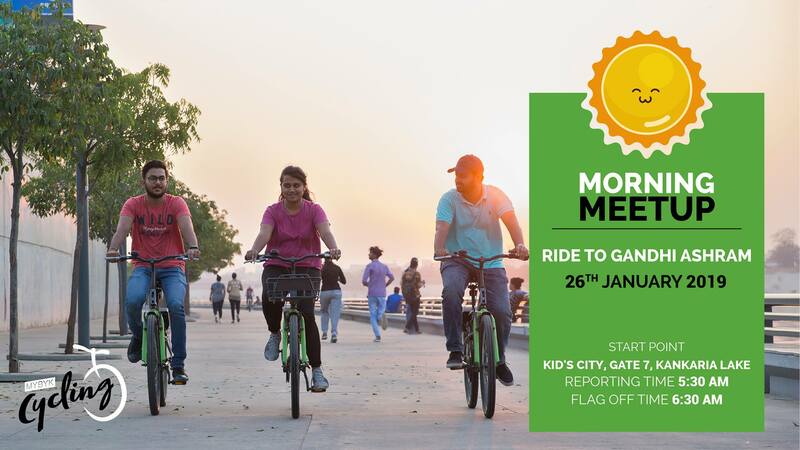 This sunday, we at MYBYK are organising a Meetup with a bike ride starting from Kankaria Lake, Kid’s City, Gate 7 to Gandhi Ashram via Riverfront | NID and back. So join us with your friends and family for a tryst with nature. Don’t have a bike? Don’t worry, you can rent MYBYK! The ride would start from Kankaria Lake, Kid’s City, Gate 7 and back. Anyone can participate in the group ride by buying tickets for the event. 2. Where will the ride start from and end at? The ride will start and end at Kankaria Lake, Kid’s City, Gate 7 and back. 3. What time will the ride start and by what time will we return? The reporting time for the event is 05:30 AM and the event would be flagged off at 06:00 AM. We expect to be back by 11:00 AM. 4. Do I need to register if I am bringing my own cycle? Yes! In that case you will have to buy the ticket priced at Rs. 100. 5. Does the ticket price include water? Yes. However, we would always advise you to carry your own water bottle. 6. Is helmet compulsory to participate? While helmet is not compulsory, we would strongly advise participants to carry & wear one. Yes you can! However, in case of rental bikes provided by us, the cycles are meant for adults. It will be your discretion to allow your kid to ride these bicycles. 8. What if I am unable to complete the ride? There will be a support vehicle available throughout the ride. For any reason, should you be unable to complete the ride, you can return the bicycle in the support vehicle and conclude your ride midway. 9. What happens in case it rains on the day of the ride and the event is cancelled? The objective of ride is to get close with nature during this rainy season and it is highly unlikely that the ride will be cancelled even if it rains. However, in the unfortunate case of it being cancelled, we shall refund your ticket amount after deducting Rs. 100/- towards cancellation fee. In any case, the tickets are non refundable. For any unanswered queries, please contact us at 7573024694. ORGANISERS, ITS REPRESENTATIVE AND THEIR ASSOCIATES AS WELL AS OFFICIALS AND VOLUNTEERS DO NOT ACCEPT ANY RESPONSIBILITY FOR ANY ACCIDENTS THAT MAY OCCUR DURING THE COURSE OF THE RIDE. ALL RIDERS MUST ACCEPT THEIR OWN RESPONSIBILITY AND RIDE SAFE.